How smart is Swagtron T580? Why Should I Choose This Model? Swagtron T580 in terms of safety? If you want to know about the smart features of Swagtron T580, you have just landed on the right platform. Swagtron is a brand which will never become old both in terms of quality and features. With a number of product models manufactured by this company, it has made a remarkable imprint in the hoverboard industry. In this article we will know some of the silent features of the T580 model and why you should go for it. You may find a better answer to this question when you know what notions you are looking for in your hoverboard being smart. In general, we would try to simplify your queries by stating that this model of Swagtron comes featured with Bluetooth enabled speakers and also an app that can work well on both androids as well as the i-phone. You can listen to your favorite song using this Bluetooth facility. More to it, you can use the app to manage your movements, to track your speed and monitor the ride. Doesn’t this sound pretty smart? There’s more to it. You can navigate and go to the destination with the help of map function which can be accessed using the app. Moreover, you can check your battery level and know when you really need to charge your batteries. Changing modes with just a click of a button using the smart app is simply amazing. You might wonder the reason why you should invest your hard earned money into something like Swagtron. Okay, you agree that it is smart but is it reliable? Does it give a good battery time and speed and range? Is it good for kids or just for adults? Well, we are here to solve all your problems. If these questions have been going around in the back of your head then you need to stop worrying and just read on. So these hoverboards are powerful offering a maximum speed limit of 7.5 to 8 mph. The plus point being added, it can climb the inclines quite smoothly up to an inclination of 30 degrees. Whoa, that’s a great feature. They offer a decent range of 8 miles. That means it can go on and on up to a distance of 8 miles in a single charge. This is a range offered by some of the top class hoverboards. 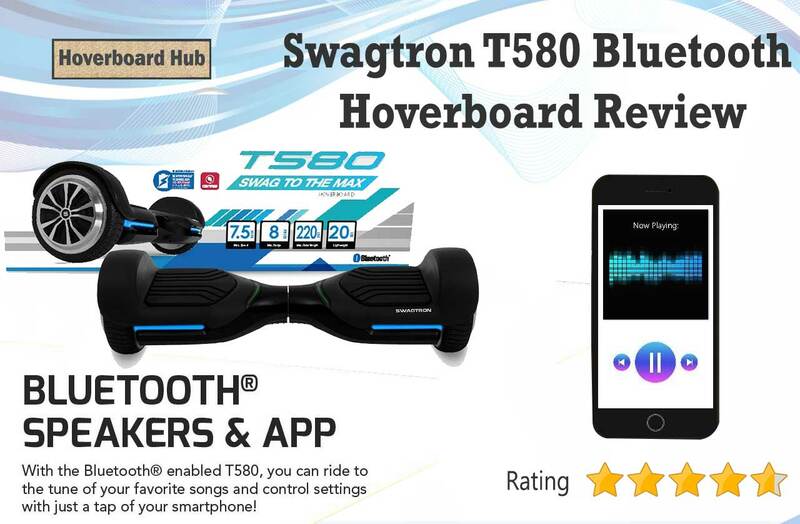 In fact Swagtron is a brand which has secured its place in the top 10 hoverboard brands. Like any other standard hoverboards, Swagtron T580 has a maximum weight capacity of 220 pounds. It can carry as low as 44 pounds to as high as 220. There are three different riding modes available including the beginner’s mode, the normal mode, and the advanced mode. The user is free to select the mode of his/her choice as and when required. So it is suited for the beginners, intermediate as well as professional riders. The wheels are pretty rigid and made of hard rubber thus making it durable. The wheels are 6.5 inches in size and work pretty well for riding both indoor as well as outdoors. The item weights around 27 pounds. It is neither too light weighted nor too hefty. If you desire, it can be carried from one place to another without much issues. The charging time it takes is less than 2 hours. So, you can easily refill your battery in the given time duration. The lithium-ion batteries are very much unstable and a slight mistake in manufacturing can prove fatal. However, the batteries used in these hoverboards are thoroughly tested and examined with best quality assurance. You need not worry about the overheating or fires. That’s one hell of the advantage the Swagtron T580 offers to you. It’s it very rare to find a Bluetooth enabled, fast-moving UL2772 certified hoverboard at such an affordable price. If you are tight on your budget and do not wish to go beyond $300 then this is one of those best choices for you. The best thing is, its not specific to a particular age group. If you buy one, your entire family can take a fun ride. When it comes to safety and quality standards Swagtron is the top-notch companies producing certified products. Moreover, the Swagtron T580 is cent percent UL 2272 certified and has gone through rigorous tests after being accredited the certifications. So overall this product is worth a purchase and is surely going to become one of your best friends. It comes in an incombustible casing and is fully protected through the SentryShield technology. There is no question of overheating or sparkling, forget about massive fire incidents. It’s all safe and handy for almost anyone. The great speed and range make it among the fast hoverboards in the market. Moreover, it is the best budget hoverboard you can find. That was all about the Swagtron T580 smart electric scooters. Hope you enjoyed unfurling the features it possesses.